A great evening out at the Slott with Simon today. 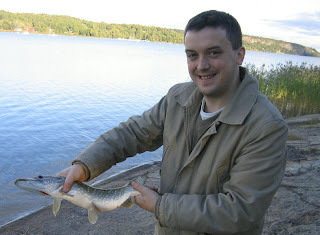 Simon took his fist Pike of the season on Sunday and was hoping to add to his point today. 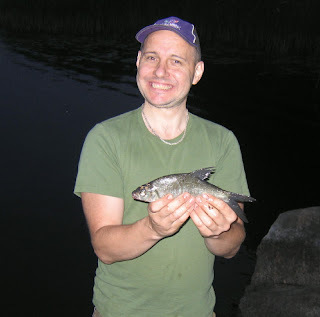 Shortly after arriving he hooked a nice Pike on a Zalt plug, unfortunatly the hookhold gave just as it was about to be taken from the water and he lost it, somewhere around 4lb..
After a small Perch on the legered worm I was then really suprised to land a really good Bream of 1.46kilo(3lb 3oz.) 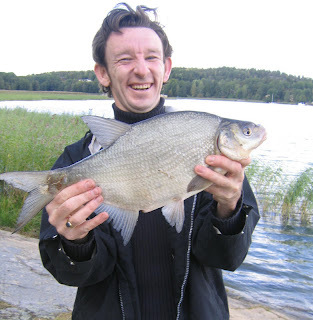 The fish is worth 3 points on the table.These fish are obviously in the area and perhaps a large amount of ground bait might bring some more large fish to the net. 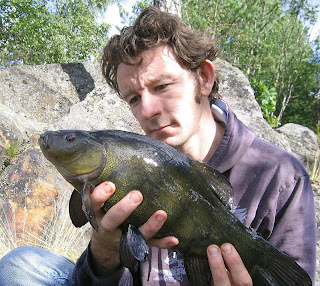 More action soon followed when my Perch livebait was taken by a super 3.10kilo(6lb 13oz. 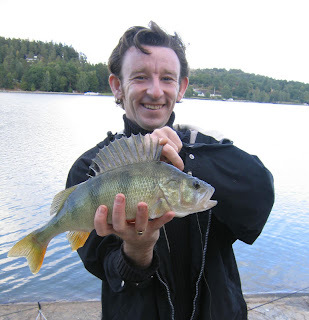 )Pike which gave me a great scrap before it was banked. This gave me another 2 points. 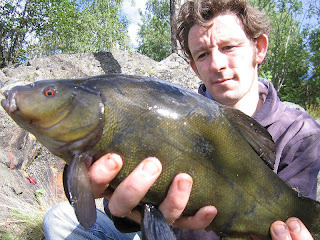 Another Perch livebait went back out and was taken soon later, this time by a cracking cannibal Perch which weighed in at .75kilo(1lb 10oz.) This was worth 4 points to me and was perhaps the best fish of the day. It also gave a really good account of itself and battled all the way to the bank. Simon then wrapped up a super evening with a lovely .96kilo(2lb 2oz.) 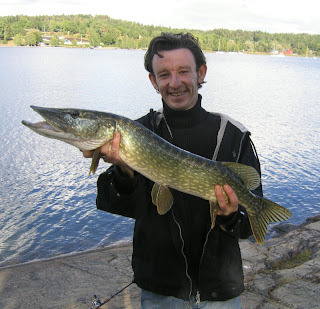 Pike which also fell to the Zalt plug and gave him a point for the day.. 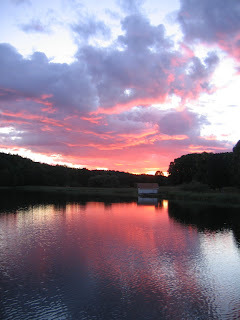 The fishing seems to be picking up as the water cools and the fish begin to feed hard to build up tone for the winter months. 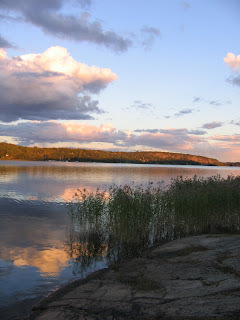 Went down to the lake for the afternoon with Linda, joining with Kevin, Sandy and young Ciara. 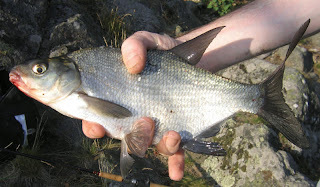 Fishing was fairly slow though a few Bream were taken, the best weighed in at .38kilo. 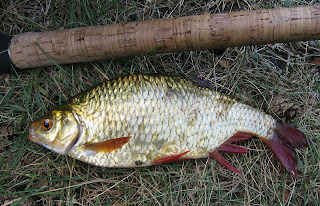 Kevin took a nice .24kilo(1/2lb) Rudd and also had a Roach. 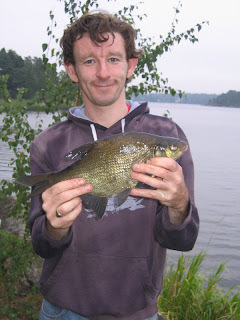 Linda had decent sized perch of around the half pound mark. Though there was a bait out for Pike no runs resulted. Dragged myself out of bed and got to the swim at 09.30. 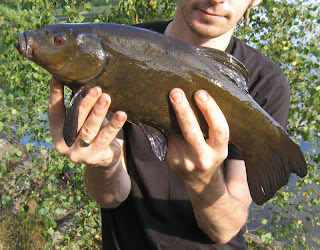 The first bite led to a Tench of 1.18kilo(2lb 80z.) at 10.20am. 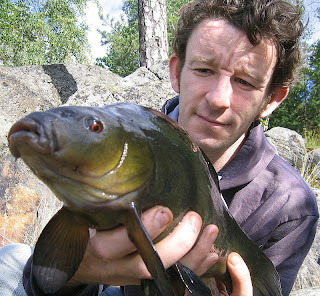 The fish is the smallest to date at the site and will easily be identified if taken again due to a scar on the flank of the fish, presumably from a pike attack at some stage in the past. 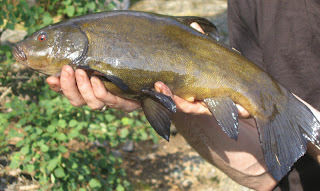 It is interesting that to date the five Tench I have managed to land here have all been different individuals, I would of thought that that perhaps one or two fish might have been caught repeatedly from the swim, assuming they are territorial and faithful to one feeding area. 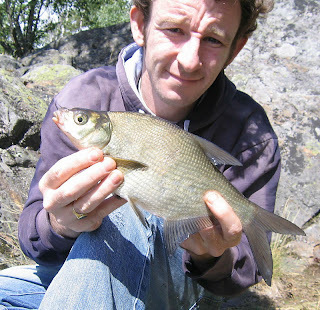 Other fish did follow with 3 Bream between 10.50am and 11.00am up to 130z. in quick succession. Sporadic small Rudd followed for the next 90 minutes before anothr 15 minute spell brought 2 more Bream and an 8oz from 12.15pm to 12.30pm. Rudd. 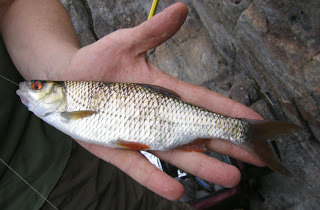 After this feeding speel things really died off with small rudd the only fish to come to hand. These feeding spells are remarkably predictable. Moon Rise this morning was at 10.50am, so feeding would be expected between 09.20 and 12.20 with noticable peaks at the these precise times and at 10.50am, when the rise occurs. It is uncanny how the bigger fish react on cue to these times! A rather quiet day with the notable exception of a 1.67kilo(3lb 11oz.) 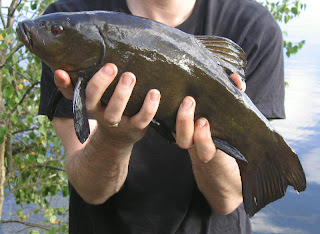 Tench that fell to my rod at 17.50. The fish falls short of 4lbs, but still gives 3 points for the tableThe fish took a red worm, despite the fact I also had a boilie in the same area. Linda and Rafa also fish through to the dusk with me, but apart from modest Rudd and Bream no other good fish came to hand, in fact as the day grew later the fishing got noticably slacker, a trend that has beeen noted before at this swim. 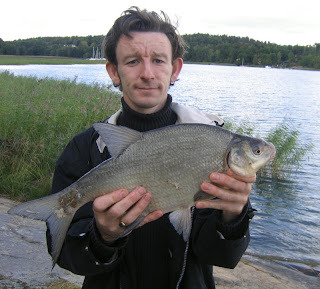 Rafal visited the swim earlier in the morning, cleared the weed by draaging the fishing swims and prebaited it.